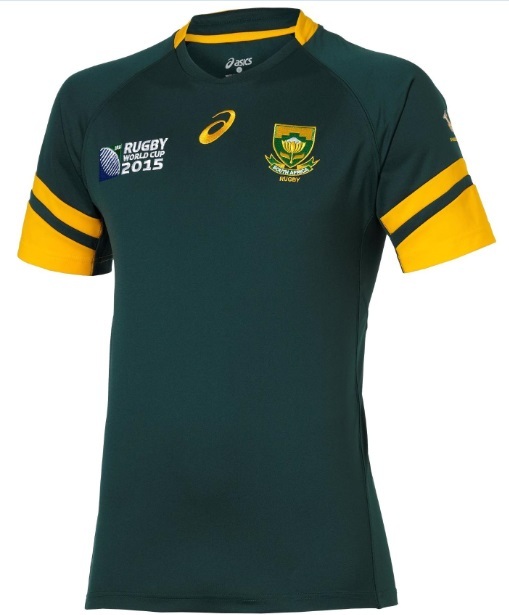 South Africa’s new home kit for 2015 Rugby World Cup was launched on 04th June 2015 by officiall kit suppliers ASICS. The new home kit comes in traditional green as main colour with yellow application on the sleeves and at the back of the small round collar. Kit suppliers ASICS will be producing jerseys of South Africa as well as Australia for the 2015 World Cup. This is the new home kit for South African rugby team for RWC 2015 in england starting this september. It comes with simple predominantly green colour while yellowish/gold application design on the sleeves and at the collar give it a South Africa colours. Springboks logo will be on the sleeves. The shorts of the home kit are white with South Africa rugby logo while the socks will be green with yellow application matched with the shirt. Since the kit is released it did not go too well with the South Africa rugby fans who claim this is dull and the fact that Sprinkboks logo is placed on sleeves rather than on more prominent place.